The points are individual states. 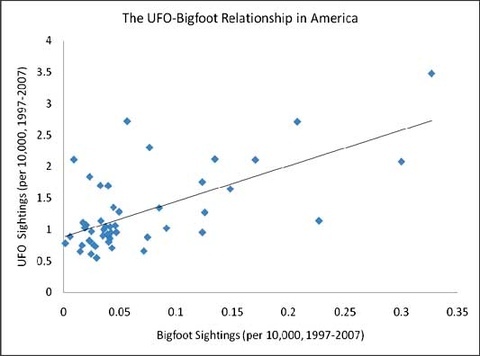 Unfortunately, I don’t know what are which, except that the two rightmost points above the trendline (which have lots of UFO and Bigfoot sightings) are Oregon and Washington. parade of lost souls, originally uploaded by Mister Wind-Up Bird. Happy Halloween! I’m already sugar-sick and out of costume! 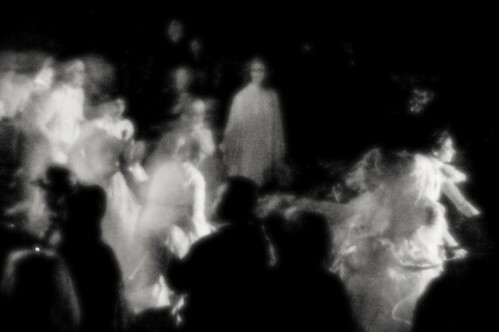 In Vancouver, the Saturday before Halloween is the Parade of Lost Souls, a procession of weirdness and costumes and lots of fire. Anything that makes life a little more morbidly surreal is okay by me. You know, my little handheld Canon ELPH might not be the best equipment on which to shoot zoomed-in videos of things falling into False Creek. That’s pretty much the Flugtag experience. Watching things fall into False Creek from a couple hundred meters away. It was entertaining enough, but I’ll admit, walking through downtown after and running across groups of cute hipster zombie chicks returning from the Zombiewalk made me wish I’d done that instead. Oh well, with any luck there will be a Zombiewalk 2007, and they might take a cue from the San Francisco Zombiewalk. There, they encouraged people to take the role of victims along the walk route — you wore a piece of duct tape on your shirt and zombies would attack you, slather you with blood and makeup, and you could join the ranks of the dead. Sounds a blast, it does. Plus, they invaded the Apple Store. Also filed in vancouver | | Comments Off on was ein flugtag ist? This Saturday offers an embarrassment of cool, and I have a decision to make. On the one hand, there’s the Zombiewalk. Last year’s zombiewalk was stupendously cool. Marching down Main Street dressed as the walking undead, freaking people out… it was truly an unlife-affirming experience. I enjoyed every minute of it. And now, Zombie Beach Party From Hell. Zombiewalk 2006: Zombie Beach Party from Hell! will happen on Saturday, August 19, 2006 . . . still lots of time left to decompose properly. Starting at 3pm at the Vancouver Art Gallery (Howe and Robson). To combat zombie exhaustion the route will be shorter! To combat zombie boredom the route will be different! However, on the same day, at the same time (roughly) is the Red Bull Flugtag! The first Flugtag took place in Austria in 1991. Since then, the dream of flying hand-made machines into unsuspecting bodies of water has spread like wildfire. From Ireland to San Francisco, inspired pilots have come out of the woodwork to construct their own outrageous craft. And while the flights have never been record-breaking, the pre-launch showmanship has always been unparalleled! Normally I would gravitate toward the Zombiewalk, which not only involves zombies, which are near and dear to my heart, but in which you get to do an actual cool fun thing. The Flugtag, on the other hand, involves standing in what is sure to be a huge crowd, watching other people do a cool fun thing. However, I’ve done a zombiewalk, but I’ve never done a flugtag. And while the zombiewalk does seem to be going ahead, it seems to be a lot less publicized than last year’s, so I wonder if it will be quite as awesome.